I guess it has been awhile since I have had to walk to concourse A at Denver International Airport, because there are now birds there. 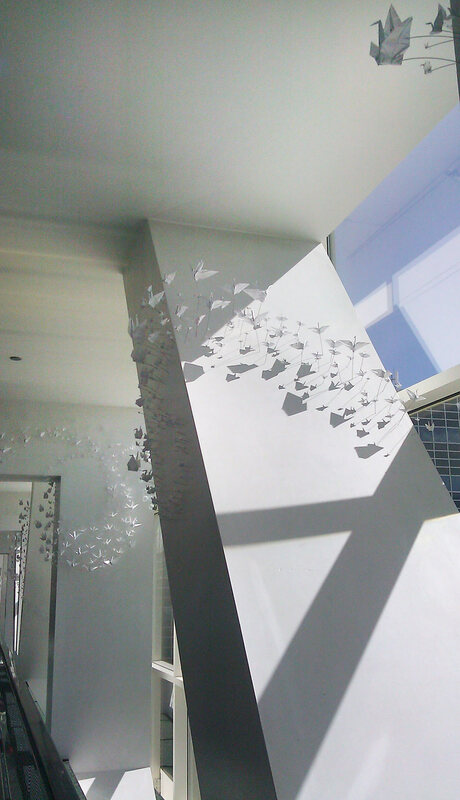 Yes, very cool little origami birds…roughly 7000 of them pinned up through the bridge walkway. Artist Brianna Martray made then out of a book she was writing (or at least I believe that is the story). I was so struck by the simple beauty of them, the lightness, that I just wanted to enjoy the moment viewing the installation in place of documenting it. I have really started to try to do that more often, but don’t think I will not stop to take a few pictures of them on my way back home. In the mean time I am in New Hampshire, then to New York…a great city for art and design!